SBE Certification Handbook for Radio Operators, 2nd Ed. SBE Television Operator's Certification Handbook, 7th Ed. The Society of Broadcast Engineers, in conjunction with CRC Press, Focal Press, Elsevier Science, McGraw-Hill, Pearson Education and other publishers, makes it possible for SBE members to purchase the best industry resources at up to 20 percent off the retail price. This collection of books is authored by an outstanding group of experts in the industry. You can browse by book title or category. The links below contain specific information for each book including; author, year, description and price. You can place your order online or download the Bookstore Order Form. For international orders, please contact the SBE. 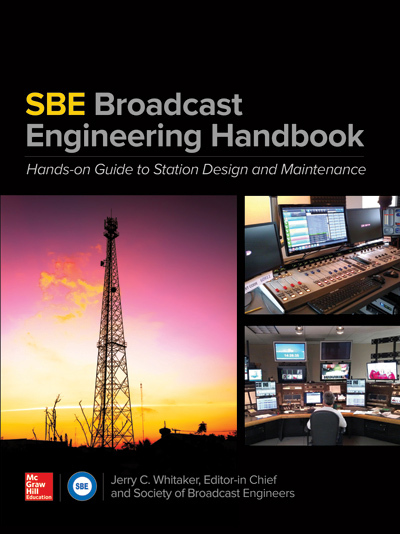 If you know of a technical book that is useful to the broadcast engineering industry, please contact the SBE.